DIE Sabbati, 15 die Decembris. Message from the King, to forward Public Bills. Precedents in relation to that Bill to be considered. Hodie 1a vice lecta est Billa, "An Act for taking the Accompts of Public Monies." "His Majesty is sorry the Difficulties have been such, that the Supply He hoped for is not yet perfected. His Majesty could with that the Posture of His Affairs would permit the giving His Two Houses a short Recess at Christmas; but, the Season of the Year being considered, and how much the necessary Preparations against the Spring depends upon the Dispatch of the Supply He assures Himself is preparing for him; He cannot think it consistent with His Service and the Public Safety, to permit any Adjournment (except for the chief Festival-days) until that and the other most public Bills be perfected, which He desires may be hastened, and which His Majesty should be glad if possible might be finished by Christmas, as well for their Ease as for His Service. "Given at the Court at Whitehall, this 15th of December, 1666." And it is ORDERED, That this House will take this Business into Consideration on Tuesday Morning next. 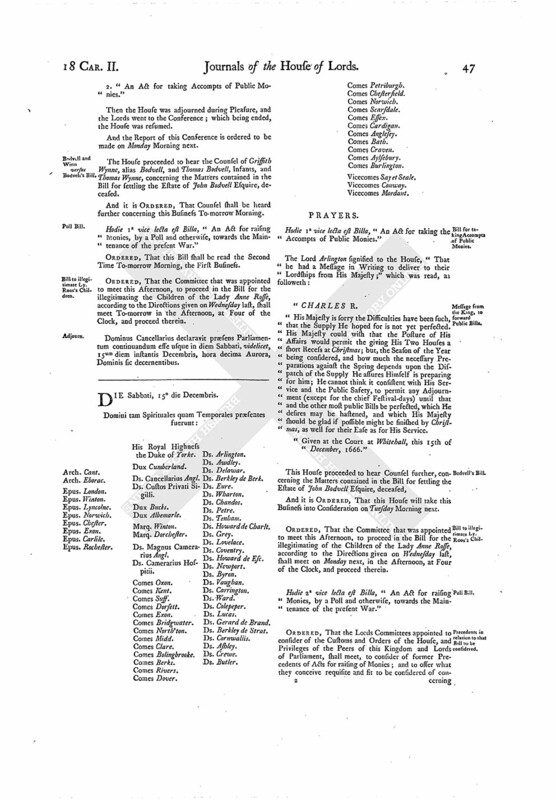 ORDERED, That the Committee that was appointed to meet this Afternoon, to proceed in the Bill for the illegitimating of the Children of the Lady Anne Rosse, according to the Directions given on Wednesday last, shall meet on Monday next, in the Afternoon, at Four of the Clock, and proceed therein. Hodie 2a vice lecta est Billa, "An Act for raising Monies, by a Poll and otherwise, towards the Maintenance of the present War." 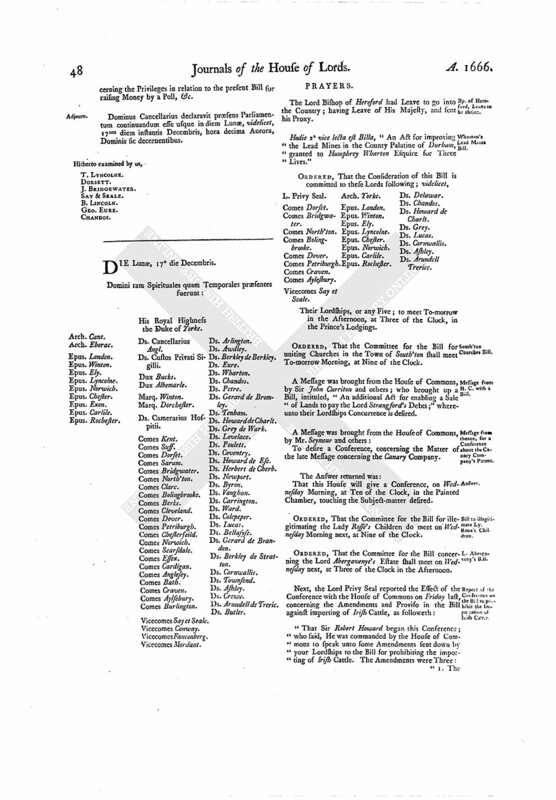 ORDERED, That the Lords Committees appointed to consider of the Customs and Orders of the House, and Privileges of the Peers of this Kingdom and Lords of Parliament, shall meet, to consider of former Precedents of Acts for raising of Monies; and to offer what they conceive requisite and fit to be considered of concerning the Privileges in relation to the present Bill for raising Money by a Poll, &c.
Dominus Cancellarius declaravit præsens Parliamentum continuandum esse usque in diem Lunæ, videlicet, 17um diem instantis Decembris, hora decima Aurora, Dominis sic decernentibus.